(APN) ATLANTA — U.S. Sen. Bernie Sanders (I-VT) talked about real issues that working people care about to an enthusiastic crowd of over one thousand supporters in downtown Atlanta, Friday night, September 11, 2015, at 200 Peachtree Street. He emphasized in his speech that no President can deal with the crisis facing working families unless there is a mass movement of millions of people who stay involved in the political process. He warns that if we don’t let opponents divide us by race, sexual orientation, or place of birth that there is nothing we can’t accomplish. “Corporate greed is destroying our economy. There is something wrong with all the wealth going to the top one percent. There is profound disgust with the system that allows billionaires to buy elections,” Sanders said to roars of agreement. He cites the Citizens United ruling as the one issue that impacts every other issue, which is eroding the foundations of democracy. He gave the example of the Koch Brothers, who have spent 900 million dollars this campaign cycle, more than both political parties. “This is not democracy, this is called oligarchy,” Sanders said. Sanders discussed wealth inequality, which he called the great moral, economic, and political issue of our time. “There is something profoundly wrong when the top one eighth of one percent owns as much wealth as the bottom ninety percent. There is a redistribution of wealth, but it goes in the wrong direction. We have to reverse that flow,” Sanders said. If elected, Sanders promised the billionaire class would not continue to get huge tax breaks when children in the U.S. go hungry. The CEOs of corporations would not get huge compensation packages while cutting wages, pensions, and healthcare benefits to employees. Mark Sawyer from Atlanta said the main issue for him was Sanders’s stand on families and children. “The resources we are putting into families and children now are an embarrassment to this county,” Sawyer told APN. One of Sanders’s goals is to abolish child poverty in the United States. It is Sanders’s straightforward truth-telling that is drawing so many people to his campaign. Currently, he has over 100,000 volunteers and huge crowds wherever he goes; he does not have Super PACs, but gets small contributions averaging forty dollars. “Nationally, Sanders is within ten points of Clinton. Based on Sanders’s current trajectory, it is not difficult to imagine a primary victory. His social democratic campaign platform resonates broadly among working Americans, regardless of political identity,” Daniel Hanley, organizer, Metro Atlanta Democratic Socialists of America, told Atlanta Progressive News. APN asked whether Sanders’s identification as a democratic socialism will become an issue for him in the General Election, given the corporate media demonization of socialism. “Young people are very excited by Bernie’s candidacy and view socialism more favorably than capitalism, according to polls. The term [socialism] has been maligned and misrepresented by the most influential voices in politics and the corporate controlled media. I’ve found that people who distance themselves from the socialist identity are highly supportive of the social democratic campaign platform,” Hanley said. Sanders provided information on little known statistics about the real unemployment that includes people who have given up looking for work and millions more who are working part-time but want to work full-time. The official unemployment number is 5.1 percent. A study of the real unemployed numbers show that unemployment of high school graduates between ages 17 to 21 who are White is 33 percent, Hispanics at 36 percent, and Blacks at 51 percent. “The United States has more people in jail than any other country in the world. There is a direct link between the high youth unemployment and the fact we have so many people in jail,” Sanders explained. “Our county should be investing in jobs and education. It costs less money to send kids to college than to put them in jail. Many young people have a criminal record for smoking marijuana, but not one major Wall Street executive had been prosecuted for causing the near collapse of our entire economy,” Sanders said. He supports free college tuition at all public colleges and universities. Paying for student debt with a tax on Wall Street speculation. “Bernie’s platform is everything we believe in, like healthcare and campaign reform. We have four kids, so we love the college being paid for,” Brian Hohla from Woodstock told APN. Another program Sanders supports is a need for a massive federal jobs program to put millions of unemployed back to work to fix our crumbling infrastructure system. “He is the only candidate who is going to fight for working families. I’ve had enough of corporate Democrats selling us out after they get in office. I think Sanders will do what it takes in terms of executive orders, that President Obama is not willing to do,” Eric Robertson, Political Director for Teamsters Local 728, told APN. “I’m a teamster who will have no pension because it is a multi-employer pension fund. The unions have been pretty much destroyed by politics for the past fifteen years. 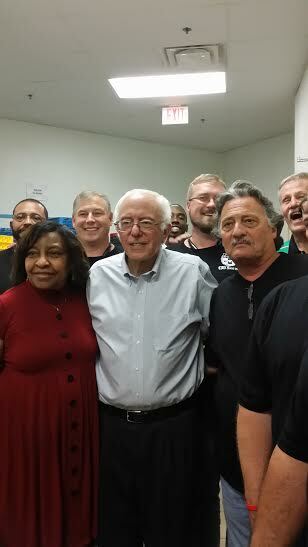 He [Sanders] is the first one to say he wants to strengthen unions,” William Nauck from Stockbridge told APN. “I think Sanders can definitely win the in the General Election because he is answering a call from the American people to run. People are interested in his platform and that is why such huge numbers are coming to his rallies,” Rebekah Harvey, a Libertarian and founder of Georgia for Bernie Sanders Independent Statewide Coalition, told APN. “It does not matter what party you’re registered to vote in or how you voted previously, he address the issues Americans are concerned about,” Harvey said. “He will not be an automatic choice for people in the South, but when they learn more about what he stands for, I believe they will realize they agree with him. It will take longer for the polls number to rise in the South, but it will happen,” Harvey predicted. Other candidates for the Democratic nomination include former Secretary of State Hillary Clinton, former U.S. Sen. Lincoln Chafee (R-RI), Prof. Lawrence Lessig, former Gov. Martin O’Malley of Maryland, and former U.S. Sen. Jim Webb (D-VA). APN’s coverage of the upcoming Presidential election will continue with coverage of the Hillary Clinton’s campaign in Georgia, as well as coverage of the Green Party’s presence, or lack thereof, in Georgia. One of the big programs transferring wealth from the poor to the rich is renewable energy programs. All these programs require subsidies of grants from federal, state, and local governments; mandates for using these energy sources, and gifts to users of these sources. The $7500 federal rebate to users of electric cars is one example. Builders of wind turbines and solar systems is another example. Propaganda supporting global warming being funded with tax dollars is another example. The total is hundreds of billions annually. Bernie Sanders and other Democrat candidates support these programs. One of the biggest programs for transferring wealth from the poor to rich is renewable energy programs. These programs give federal, state, and local grants to producers of renewable energy; mandates for their use, rebates for their use; etc. Look at federal $7500 gift for buyers of electric cars going to the top 20 percent, etc. The total amount is probably in the $100 billions per year. Bernie Sanders and Democrat candidates support these programs. Its becoming clearer every day that Bernie Sanders represents the direction the democratic party needs to go in. Unfortunately the current crop of democratic establishment candidates are really “neo-liberals” which means they are extremists more to the right than Reagan. This is why people say there is really only one party in Washington. Sanders represents the direction of the USA during the 20th century, until our political system was hijacked by corporate money. Time for fundamental change, the change Obama promised.. but instead of delivering, betrayed the American people.